The Jazzy Select 6 provides maximum front stability combined with the advantages of in-line motor technology. Active-Trac Suspension and 6″ rear and front castors offer superior performance indoors and out. An impressive selection of standard convenience features make it the easiest power chair to use. Frame is rigid and made from epoxy coated steel. The plastic body work is available in a red colour only. 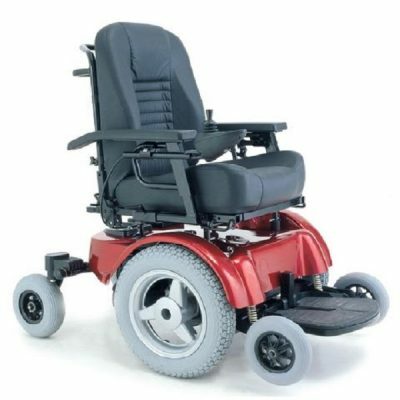 The wheelchair features a suspension system which enables the wheelchair to travel up small steps up to 25mm in height. Seat is a foam padded, grey vinyl upholstered seat and features manual height adjustment (via the use of tools). The seat has a lever located under the right hand side of the seat to operate a 360 degree swivel mechanism (which can be locked every 90 degrees). The seat is available in one depth and width only. Backrest is a padded and grey vinyl upholstered backrest which features a manual recline mechanism operated via a lever located at the base right hand side of the seat. The backrest can also be folded flat onto the seat to facilitate transport. Headrest is foam padded and grey vinyl upholstered and is height adjustable. Armrests are full length, padded, removable and flip-up. Both armrest are height, width and angle adjustable. Footplate is a single piece, flip-up, height and depth adjustable plastic footplate. Centre Wheels are 250mm (10″) diameter, solid tyres. Front and Rear Castors are 150mm (6″) diameter, solid tyres. Controls can be mounted on the left or right armrest. The controller is a 40 amp programmable controller with a joystick for direction control, speed adjustment knob, horn and on/off button. Batteries are two 12 volt, 35 amp deep cycle batteries located under the seat. The batteries can be charged using an off-board battery charger which can be connected to the wheelchair via a port located underneath the joystick on the controller and to a mains power point. 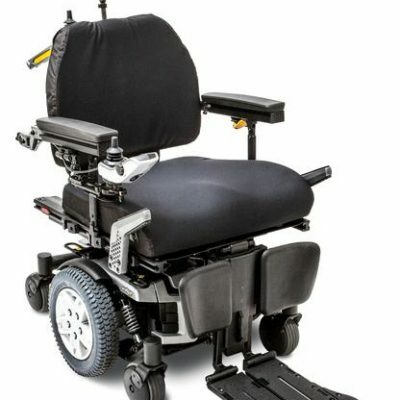 Motor Disengagement is achieved by moving two small levers located next to the rear wheels on the base of the wheelchair.